Photo credits courtesy of Ariana Johns, used with permission. 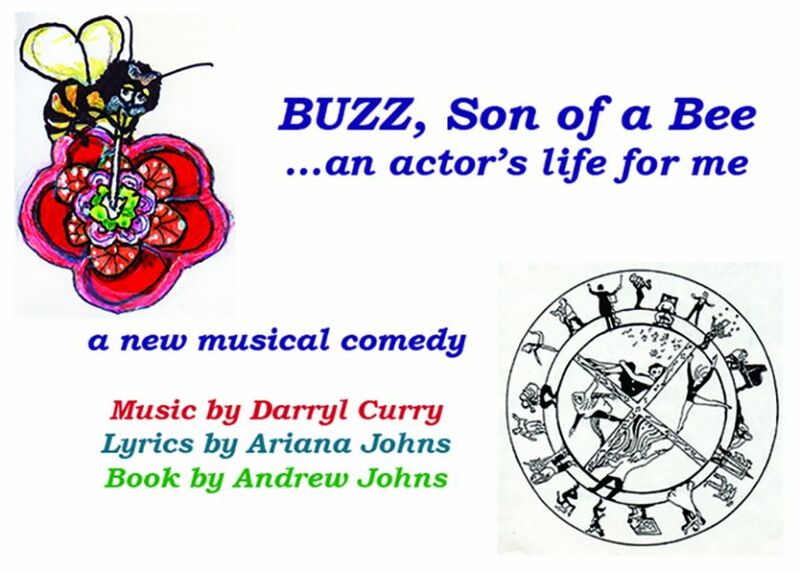 Ariana Johns is the lyricist for the play "Buzz...Son of a Bee" which centered on the life of actors. Ariana Johns is a lyricist who also writes plays which have been performed all across the United States. Her works titled “Moonbite...a montage of radiant lunacy” and solo-show “Vampingo...a comedy with bite” have been featured at Fringe Festivals in New York and Ariana--who is also an actress--has appeared in plays and comedy shows across the nation. She has a musical comedy and improv group called “OK, So We Lied!” and appears as a duo with John Ten Eyck (who has appeared on MTV) under the title “Too Idiots” which has enjoyed three sold-out tours. One of Ariana's most recent projects is called “Buzz…Son Of A Bee” which is a musical comedy about the life of actors. Ariana was the lyricist of this piece. This play won the Golden Fleece Ltd. 22nd Annual Award for Music Theatre in progress and it was also selected for readings at The Actor’s Temple, The Dramatists Guild and the St. Clements Theatre. It was also produced at The Woodstock Fringe and, in 2016, a concert version was sponsored by A.C.A. Galleries in the Chelsea neighborhood of New York City. AXS: What inspired you to start the Vamping O Productions Theater Company and why was that specific name chosen? Ariana Johns (A.J. ): I founded Vampingo Productions several years ago, when I found myself producing an increasing number of projects. I've been fortunate to have some wonderful Producing Associates, such as Greg Mullavey and Nora Davis. The name came about from a short story that I wrote as a young woman, entitled ‘Vampingo!’ It was a darkly humorous piece that utilized magical realism, about a young man who accidently creates a vampire flamingo (Vampingo). Vampingo was the hero of the piece, rescuing a young ballerina/pole dancer from a nefarious stranger. Later I developed a solo show that was very loosely based on that story, ‘Vampingo…a comedy with bite’. It was developed in Los Angeles with Jolene Adams, Artistic Director of Actor’s Art Theatre, where it had a successful run, prior to its production in the New York International Fringe Festival, and a special engagement at The Lodestar Theatre. AXS: So far, how many plays has your company produced and how do you acquire them? A.J. : As Producing Artistic Director of Vampingo Productions, I have produced/co-produced stage, video and cabaret productions. So far, the pieces that I’ve produced have been ones that I’ve written/co-written, or that someone close to me has offered directly to me for production. A personal favorite is the comedy revue, ‘Moonbite…a montage of radiant lunacy’, which I wrote with John Ten Eyck. It went through several incarnations, and each time it was enthusiastically received—it’s such a fun, quirky, darkly funny piece—I’m planning to produce it in NYC once BUZZ is fully funded. Overall, my goal for Vampingo Productions is to have a Production Company where I can invest in and produce new plays and musicals. There are several shows that I’ve had the opportunity to see in development (via the Off-Broadway Alliance and The Dramatists Guild), that I would love to invest in. But for now, all my efforts are engaged in bringing BUZZ, Son of a Bee to the boards Off-Broadway at St. Luke’s Theatre, in the heart of the Theatre District. AXS: How did you come up with the idea for your play, “BUZZ Son of a Bee”? AXS: To date, what has been the most rewarding part of working in the theater industry? A.J. : Trite as it may seem at first, to me there is no bigger joy or raison d’être than creating Art. Whether it’s writing, acting, singing—or even producing (a creative act in its own way), that’s the sweet spot in life. It has always been this way for me—I was born into a family of actor/writers. My parents and I have supported each other along our creative journeys, and BUZZ marks the first time that the three of us have worked together on a project, with Andrew being the Book writer and my mother, Evangeline Johns portraying ‘Cora’ in the piece. I’m also in the cast, portraying ‘Carla’, as well as writing lyrics and producing. I have written short stories and lyrics my whole life, and I earned my living for many years writing and performing comedy. We’re also working with some grass roots Bee Conservation organizations (Planet Bee Foundation, Pollinator Partnership), and we’re looking to partner with a local honey producer to raise awareness about the importance of bees and other pollinators. AXS: What advice would you give to someone who is striving to enter the theater industry? A.J. : As far as advice for my fellow theatre people, I’d say that we have a tremendous opportunity in this day and age to create art and have it seen, what with the internet and the ever-expanding platforms for exposure therein. It wasn’t that way when I was starting out and we had to really hustle to get anything done/seen. That said, be sure that you’re working on projects and/or with people you believe in, rather than just working for the experience alone. Too often, I’ve seen young actors give their all to projects that they subsequently regretted. It’s a rite of passage, we’ve all done it, but these days, especially when you’re working for no pay, I strongly recommend doing as much research as you can about your collaborators so that you don’t waste your time or wind up in too many sub-par projects that will come back to haunt you. But write, tape yourself, collaborate, take classes—find your unique voice! There’s no greater community than the Theatre, and no greater joy than sharing your artistic vision. Shine on! Also join groups like the Dramatists Guild, the Woodstock Fringe Playwrights Unit, the Musical Theatre Factory, the Off Broadway Alliance, the Actor's Art, T.R.U, and WomenArts. They help support you and make connections. To learn more about “BUZZ Son of a Bee” visit its official website and Facebook page. To purchase tickets for the upcoming performance on Saturday, April 16th at The Metropolitan Room, see here. To learn more about Vampingo Productions visit its website.